Tripp Lite's T1, RJ45-RJ45 , ( RJ48C ) Cross-over Patch Cables are constructed with premium Quabbin 9720, T1 certified cable. Two individually shielded, 22AWG, 100ohm pairs, maximize the performance of your expensive T1 circuits and equipment. Beware of generic T1 patch cables made with inexpensive Cat5 unshielded patch cable. The American National Standards Institute ( ANSI ) states in ANSI T1.403 that T1 cable be constructed of two balanced pairs, 22 AWG Solid conductor, 100ohm impedance, with a loss budget of 5.5db. Cross-over wiring configuration available in 0.91 m (3-ft.), 1.52 m (5-ft.), 2.13 m (7-ft.), and 3.05 m (10-ft.) lengths. Custom lengths available...consult your reseller. Also available in Straight-through wiring configuration...see Tripp Lite N265- Series T1 patch cables. Beware of generic T1 patch cables made with inexpensive Cat5 unshielded patch cable! 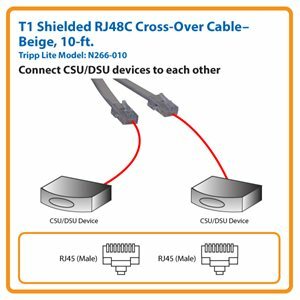 This ten-foot Tripp Lite T1 Shielded RJ48C Cross-Over Cable is made from premium Quabbin 9720 T1-certified cable. It meets or exceeds all ANSI T1.403 (Carrier-to-Customer Installation – DS1 Metallic Interface) standards. Use the N266-010 to connect CSU/DSU devices to each other. The connectors have RJ48C wiring to transmit signals over the long distances required in T1 networks. Made from premium Quabbin 9720 T1-certified cable, the N266-010 has two balanced pairs with 22 AWG solid tinned-copper STP construction. It has a 100 ohm impedance level and a loss budget of 5.5 decibels. The N266-010 has a PVC jacket and gold-plated RJ45 (male) connectors that are wired to the RJ48C T1 cross-over specification for an accurate signal transfer. The N266-010 is compliant with the Federal Trade Agreements Act (TAA) for GSA Schedule purchases. For peace of mind, the N266-010 comes backed by a lifetime warranty. It’s manufactured in compliance with strict RoHS specifications, reflecting Tripp Lite’s commitment to environmental responsibility.